Hello Everyone, I wanted to pass along a few tips if you’re thinking about visiting one of the Caribbean’s most beautiful and romantic islands ... Aruba. If you’re willing to get off and on the plane a few times, we scored a great price with American Airlines flying first class the entire trip for just $1,500 each round trip. Plus it’s a breeze … less than three hours by air from Miami and with U.S. pre-clearance at the airport, the only Customs officer you’ll talk to on your way home is the one in Aruba. If you’re going back and forth about which resort hotel to stay at I can definitely make a recommendation. 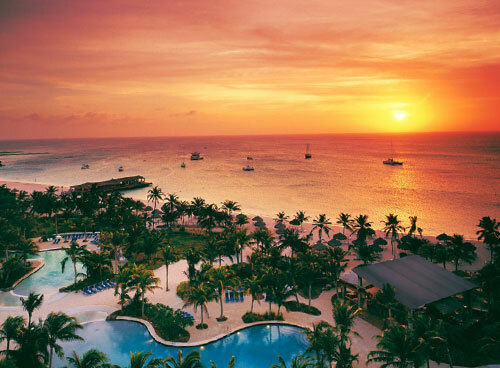 The Aruba Marriott Resort & Stellaris Casino is the ideal choice for the ultimate Aruba vacation. Enjoy the exquisite hotel accommodations along with an adult pool, and the exclusive Tradewinds Club - an upscale hotel-within-a-hotel concept - on the top floor of this Aruba resort. At the Tradewinds Club guests that book these accommodations may indulge in upgraded amenities, five daily dining presentations in the private lounge, a member-only beach area, and also includes full access to the Tradewinds Concierge Service. This floor is exclusive to adults only. of course with some of the best steaks, fresh seafood along with their assortment of classic desserts. Reservations are recommended … a bit pricey, but hey you’re on vacation. It was one of our favorites! We had dinner here one night. They serve some of the finest mouthwatering seafood you will ever eat. 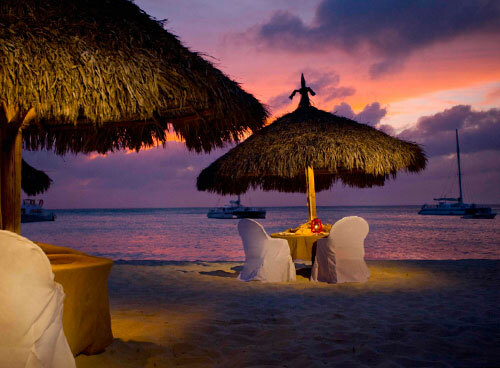 A great candle light experience with your own private table on the beach. Considered to be among the cleanest, broadest and most beautiful in the Caribbean region, Eagle Beach and Palm Beach are some of the best beaches in the world. Hint – if you want a cabana on the beach, you need to get up early to reserve. Breathtaking diving can be enjoyed on Aruba, especially along its sheltered southwestern coastline. A large number of outstanding reefs are a great opportunity to explore magnificent coral formations while being surrounded by a large variety of tropical fish. If you’re considering paying a bit more for some extra amenities and upgrades, do the math to figure out if the other perks are worth the extra cost. In the case of the upscale Aruba Marriott, upgrading to the Tradewinds Club is likely worth it — especially if you take full advantage of all of the included food and drink. If you feel the need to go shopping … you’re in walking distance to the Palm Beach Plaza Mall. I’d strongly recommend taking the Catamaran Excursion to experience Aruba’s spectacular sunset aboard a luxury catamaran. Enjoy views of Palm Beach from the open water as you sip a cocktail and watch the stars come out. Relax as the friendly crew entertains you with local music, dancing and storytelling. When planning your next beach vacation . 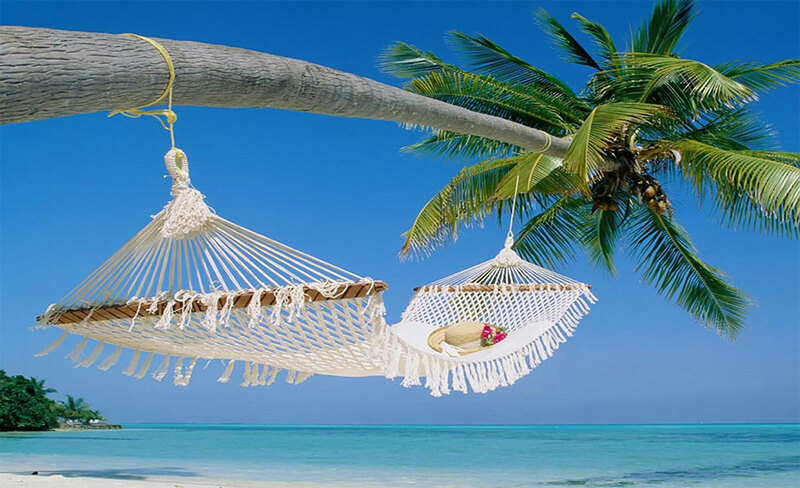 . . and maybe you’re a bit tired of the Hawaiian Island … give Aruba some thought; Aruba has some of the best white sand beaches in the Caribbean along with great diving, some of the best tropical night life you can find anywhere … plus you can always count on sunny skies. 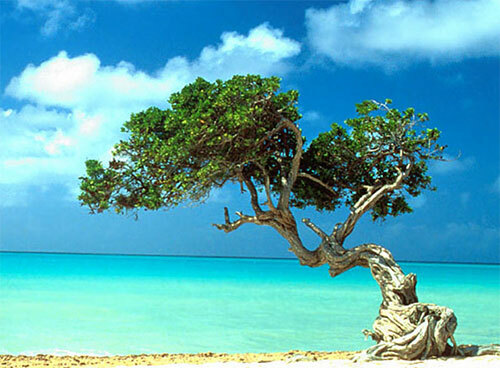 Aruba is an ideal destination because it is located in the Netherland Antilles outside the hurricane belt.